We Southern girls like to stick together, and I have a love for all things Southern, so today I invited my friend, Teeny Templeton, to be my guest. She's a pastry chef, and loves all things food, so settle in for a tasty ride through Charleston. My full name is Christine Bluette Templeton, and I'm barely five foot two (5' 1 3/4" to be exact)—everyone calls me Teeny. and I was too sweet for my own good. Ruby Ann drank a six-pack of Coors Lite, then knitted a hat to cover my "possum head." She thought my hair looked like something that lived in the Okefenokee Swamp and ate rats. After Ruby Ann sobered up, she spread her arms and said, "Don't worry, Possum Head. All the Templeton women have big hair and bigger hearts." Ain't that the truth. Last night, Coop O’Malley and I went to a dinner party at Palmetto Place, the oldest private club in Charleston. 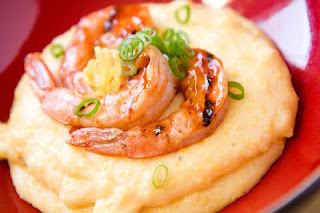 It's also (supposedly) the birthplace of the shrimp-and-grits martini, which is my favoritest appetizer in the world. 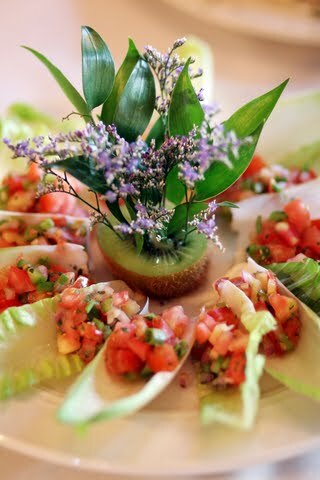 Since I’m a self-taught pastry chef, my thoughts were on hors d’oeuvres, not the view, so I borrowed Coop's iPhone and took a few photos of the food. A totally awesome swan ice carving dominated the buffet table. Savory smells wafted over the terrace, luring me to the bacon-wrapped water chestnuts--traditional but tasty. When I was growing up in Bonaventure, Georgia, at least a dozen Baptist ladies made these appetizers for every church picnic, and each one was different, just like the ladies—saltly, sweet, tart. But I had fancier fare on my mind. I squeezed through the crowd, inching closer to the seafood bar. Be still my swamp rat heart. 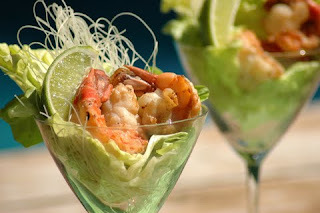 At last: the famous shrimp martini—but it’s gritless! Still, it looked delicious, just the thing for a balmy Low Country night. I ate one and moved along to the olive bruschetta with basil. Next, I tried salsa on endive leaves. Note to self: use a kiwi for a centerpiece. I skipped the modern finger sandwiches, even though I love prosciutto and greens, because I wanted to save room for dessert. Halfway to the chocolate mousse, I saw oysters on the half shell. Raw oysters should be eaten during an “R” month—and it’s June—but I scarfed down four and got so thirsty, I grabbed a pomegranate martini. Right about now, I’m feeling a tad stuffed, and I got so woozy, I couldn’t tell a pound cake from grits. I ran into Coop at the salad bar. He was eating black eyed pea salsa. At the next table, I saw shrimp-and-grits—piled onto a plate, not a martini glass. I couldn’t resist the tiny crab. They had a cute, little squash base, topped with basil, tomato, and a fingerling potato. I came upon a slew of unidentified poofy things. Sweet or savory--it's anyone's guess. And I found a possum head thing. The next table got back to basics with cherry tomato skewers. I was tempted by the mini seafood bites—each one was fashionably dressed in a thin zucchini wrapper, topped by a sun dried tomato. Chocolate petit fours with chocolate roses. I saved room for key lime mini pies. Had I missed anything? I circled the table twice, and once again I came face to face with the possum head. I ate it. Then I reached for a butterscotch pudding chaser. I’ll be in carb hell in the morning, but I’ll worry about that later. When I couldn’t eat another bite, I grabbed Coop’s hand and pulled him toward the door. Our tour de hors d'oeuvres ended with a walk in Battery Park. The night was clear and warm, not too muggy. A band played a Miles Davis song, something about falling in love, and what began with an appetizer ended with a kiss. Charleston is for lovers, but in my zip code, trouble is never far behind. And, another song will start playing. What fun! You and your hair sound very interesting. Omph! There was a goof up with my friend Teeny's post. It's fixed now! 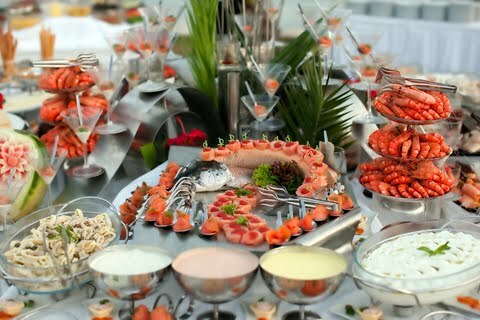 Look at all that scrumptious food! The food looks amazing...I'm starving! And the book sounds delightful. Especially the hair. Thanks for sharing with us, Teeny. I loved reading Teeny story and look forward to her next adventures.